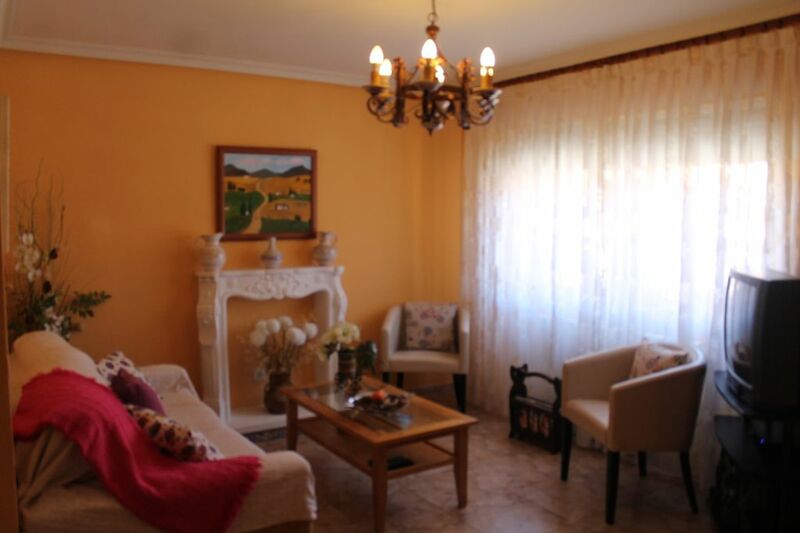 House located in the town of Olmedo in an extraordinary historical and artistic environment, close to the Moorish theme park and its fabulous spa town of Olmedo. Besides enjoying the historical and artistic heritage of the town, in the municipality can develop many activities; also it has quality sports facilities (municipal semi-Olympic pool, racquetball, sports court, football etc) in which they can perform outdoor sports and family. We must not forget that Olmedo has Mudéjar The Theme Park, the week of Classical Theatre in the summer and Spa Villa de Olmedo throughout the year. Olmedo is in a privileged position and well connected to Madrid and the provincial capital, Valladolid, which you can go to live an unforgettable day of sightseeing. Home Features: tarmac entrance, pets, hot water, hot water, cleaning supplies, toilet, bathroom, barbecue, coffee maker, heating, heater, hood, aluminum, safety lock, kitchen admission , pantry, double glazing, information about the area, appliances, countertop, audio equipment, exterior, fire extinguishers, refrigerators, large living room, hall - reception, oven, tourist information, dishwasher, free firewood, microwave, garden furniture does not admit cards, patio, iron, reinforced door, radiator, receiver, dryer, sofa - bed, clothes, video / DVD, cooker, smoking area, common seating areas. Toiletries, toilet, bathtub, heated rooms, shower, hair dryer. Good communications, in the village, picturesque site, near public transportation, tourist area. Located 18 kilometers from the ancient 'Cauca', now Coca between the region and vacceos arévacos, is 45 kilometers from Valladolid. Its good location, bounded by rivers Eresma and Adaja has allowed enhancing their irrigated crops, focused primarily on the beet-of which share its sugar-related industry, although most of its lands are traditionally devoted to dry. Worth mentioning the wide tree extension that has the municipality, in particular pine. Livestock is also remarkable, especially sheep and poultry sectors. As it draws to Olmedo, the air seems filled with verses and those older. But Olmedo has very well alone. And also it has walls. Land of pine which rises south of the city of Valladolid and Segovia way through the portholes, the Upper and Lower, also called Arrabal. Monuments of the City of Olmedo: Centuries of influence and splendor have left us in this villa an exceptionally rich heritage. It's old Olmedo said in the 'seven seven': seven people, seven convents, seven churches, seven seater, seven arches, seven sources and seven stately homes. The inventory is thus large and therefore could highlight the church of Santa María del Castillo, with its Gothic doorway; that of San Miguel, a mixture of Byzantine, Gothic and Arabic, where a beautiful Moorish tomb we admire. It is the crypt where the Virgin of Soterraña, patron saint of Olmedo, and the well with its legend is venerated: it is said that olmedanos by invading Arab peninsula, hid in the crypt the image of the Virgin, he remained buried over 330 years. Hence its name of 'Soterraña'. Or the magnificent church of San Andrés, with its admirable Mudejar apse. The village of Olmedo his shield emblazoned strip game: in the head, a green elm with two lions gules. The master bathroom is located in the plant room, it has tub with shower and bidet. The toilet is located on the ground floor, to make your stay more comfortable. Excelente opción en Olmedo para hospedarse!